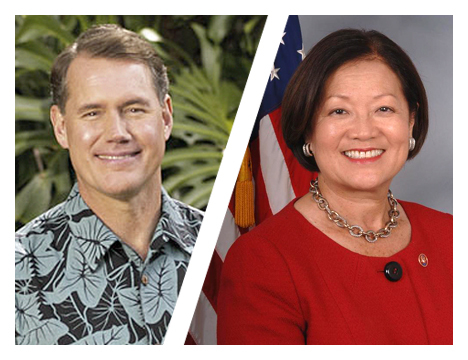 After months of prodding from Congressman Ed Case (D-HI, 2002-2007), Congresswoman Mazie Hirono has finally agreed to debate him. Since October of 2011, even through this week, Case has agreed to more than 10 debates. Some of those events have already passed with Case as the lone attendee. “This schedule is shibai”, said Case. “In cherry picking just a few with the least possible exposure, they’re fooling nobody. This is plain and simple about avoiding any real statewide public discussion at all costs and is typical of what’s wrong with DC today. A statement from Case’s campaign said the invitations rejected by Hirono include: KITV4/Civil Beat (statewide TV debate); KHON2 (statewide TV debate); Hawaii News Now/Honolulu Star-Advertiser (two statewide TV debates); Chamber of Commerce of Hawaii; Kona-Kohala Chamber of Commerce ; Hawaii Lodging and Tourism Association (Big Island); Hawaii Crop Improvement Association; and Hawaii Pacific University. Pending invitations include the Honolulu Japanese Chamber of Commerce. A televised candidate forum hosted by PBS Hawaii on June 14th. “This is a critical election, and every Hawaii voter wants and deserves every opportunity to size us up side by side and make this decision for themselves. We want our candidates and public officials to discuss openly and directly with us how we’ll fix Washington, grow our economy and much more, not hide behind handlers and spin. “Our next Senator must be able to provide strong effective leadership in the world’s greatest deliberative body, to stand and fight for us in DC, and to keep in touch with us back home. It’s tragic that my opponent is denying Hawaii’s voters the opportunity to judge for themselves who can best do the job,” Case said. Case was hoping for several Lincoln Style town hall debates across the state, so voters can hear from the candidates themselves in person before casting their vote. “The campaign’s real slogan is: ‘No Debates; Just Watch My Commercials’. I hope voters see through the slick ads upcoming to what’s really going on,” Case said. He notes there are just over 100 days until the primary election, and even less until absentee voting begins. Mr. Case, don’t blame DC, blame Hirono for shirking her responsibility to Hawaii’s voters. With her refusal to debate you in a Statewide televised debate, it not only deprives the voters of necessary information to make an informed choice but it also sends the wrong message to her constituents. Hirono needs to reassess her priorities, her high maka maka attitude and her commitment to “We the Voters” or she will find herself “spending more time with the family”. I don’t know what other dates were on the table, but between Graduations and the Memorial and Kamehameha Day holidays it looks like Mazie picked the days when there’s a slim chance of anyone watching.